I am aware that both Chinese New Year [CNY] and Easter are based upon lunar cycles and that they seem to be disconnected from each other and so I thought it was about time I researched this properly. I have inserted an Excel file¹ showing the dates of both festivals from 1980 to 2025 and the gap in days. I am struck by the repetition of Easter dates. 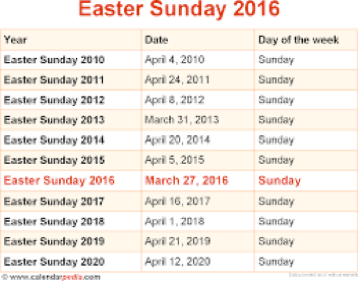 Quoting wikipedia - computus; Easter Sunday is the Sunday following the paschal full moon date. The paschal full moon date is the ecclesiastical full moon date following 20 March. The Gregorian method derives paschal full moon dates by determining the epact for each year. The epact can have a value from ＊(=0 or 30) to 29 days. Remembering a table in the Book of Common Prayer that I used to look at when waiting for services to start, there’s a ‘golden number’, g, worked out as g=y(mod19)+1. so for y=2016, g=3 [2016 mod 19 is 2]. 𝓁=((y-1400)/100*8)/25, which for 2016 is 1.9712. To get the paschal full moon date, p, we need first p’=(3-11g+s-𝓁)mod 30, so for 2016 p’=(3-33+3.12-1.97) = -28.85. This needs no further correction for leap years like 2016, so p is -28 or -29, so (mod 30) 2 or 1. This locates the date of the paschal full moon (strictly) after 20th March, (≥21st March). Easter is the next Sunday after this, so March 27th. Easter requires a Friday and a Sunday and this follows 40 days of Lent, so Ash Wednesday, the festival at the start of Lent, is a critical date that I pursue simply because it could coincide with CNY. While Easter depends upon Ash Wednesday—when Jesus went into the desert at the start of Lent—which depends upon the lunar cycle, since Easter is the more important festival, we tend (now) to work out Ash Wednesday backwards from Easter. There is some measure of reason to the position of Easter. Lent is 40 fast days, Sundays excluded, so it is 46 days before Easter. Many problems result from dispute about which part of which moon cycle to follow. Complications are many, disputes have run for centuries and there have been several attempts to simplify the situation. The history is worth reading and you could do worse than read the several wikipedia entries. There are 35 possible dates for Easter. This causes problems in co-ordination with what we might call lay circumstances, mostly because of the variability. There are pressures to demote the most important festival of the Church calendar to, effectively, irrelevance. If you prefer, we might recognise pressures to make Easter on a par with the important festivals of other religions, such as, say, Devali. That is at odds with any claim the UK might make to host the Church of England, but such is the pressure brought to bear. Of course, cynical me says “Brought to bear by whom?” and answers that with “Those who think they have the power”. Probably the twin enemies of Press and politician [not a statesman, but the pain that is only interested in the me-me-me of associating some great change with their name and face]. It would be far better to simply add other festivals to the national calendar. Ash Wednesday, which just might overlap with CNY, falls between Feb 4 and Mar 10. The Church insistence on a particular day of the week tends to help coincidence not happen. My table shows that gap between Ash Weds and CNY for 1980-2025. In that period it ranges from -2 in 1991 to +35 days in 2025. (i) CNY should be the new moon closest to the beginning of spring. (ii) CNY will be 10 or 11 days earlier than last year until falling outside Jan21 to Feb 21, when it leaps 18 or 19 days later. Complications stem from, of course, the lunar cycles and in turn from the need for leap months to compensate. Leap years in the Chinese calendar will not necessarily coincide with those in the Gregorian or Julian calendars. Critical issues here centre around what the moon is doing at the December solstice and the test is to count whether there are 12 or 13 new moons in the year. So we expect CNY to fall between Jan 21 and Feb 21, while Ash Wednesday should fall between Feb 3 and 35 days later, Mar 10. Say I. CNY will never coincide with Easter and for people affected by both festivals the crucial matter is the interval between them. Please look at the spreadsheet. Of course, if you’re Greek orthodox, you’re still working on the Gregorian Calendar. So, you’re automatically 11 or so days different and sometimes that will shift Passover by a whole lunar month. Go figure. I caught a radio programme on this very topic in about March 2016 (as if someone had read this very page and reacted), probably one of the Beyond Belief series. There is, understandably a campaign to have a common date for Easter. I do not see this succeeding; churches are historically immovable. That attitude does nothing to recommend them as modern institutions, but then maybe modernism is something they also fight against. Insertion process: save Excel selection as html. Open the .htm file with a suitable text editor so youu can see the html. Copy this completely as an html snippet. There’s probably a nice way of locating this dynamically on the page, but what I did was insert a blank text box of roughly the right size, set up iWeb to wrap around that, slap the spreadsheet on top of this mask and fiddle with its size until satisfied. The 2017 move to Sandvox didn’t affect this; odd. Another, simpler, way to achieve this is to take a screenshot and copy that as a picture file. 2 The answer is hidden in the Gregorian part of the wikipedia article. Solar and lunar corrections repeat after 4x25=100 centuries. During this time the epact had moved by—wait for it—17mod 30. That 17 is relatively prime, as is the essential unexplained 19 built into the golden number. So the 100 centuries is multiplied by the 30 possible epacts and by the 19 golden numbers, making an unbelievable 57 thousand centuries. We’ll have changed the calendar again before that happens or we’ll have killed ourselves off, so in effect a better answer is that it won’t happen; man won’t be here when that moment does occur. top pic stolen from images on Google. I just wanted as something to place there. Better suggestions gratefully received.